If your teeth feel like they are deteriorating, chipping and wearing away while the front teeth are getting shorter and shorter, there is a solution to restore your smile. Commonly patients and their dentists are doing “One crown at a time”, picking the worst tooth in the mouth and putting a crown on it, many times made of gold so it doesn’t break, while the rest of the teeth are left deteriorating. There are many problems with this plan of treating problems, rather than treating causes. There is a cause for the deterioration of the teeth and until that cause is addressed, the teeth will continue to chip and wear away until there is little left for eating and smiling. It is much better for you and your dentist to come up with a plan to treat the causes of the tooth problems. When you are finished getting crowns and you hate your smile, because the teeth are still short and ugly, you are going to look for another dentist with more qualifications to give you a smile makeover. The dentist will hopefully tell you that they need to treat the bite and the results will mean that you can have normal length and shaped teeth again. The only problem is that you already had your teeth prepared for crowns that made the teeth very very small and now the dentist is going to make the teeth long again. That means that not only did the teeth never need to get drilled down to tiny teeth, but the chances for post operative complications rises significantly as the new longer crowns are supported by very small teeth underneath. The teeth have already received crowns that have been prepared under the gums, causing gum irritation, this makes using the beautiful porcelain materials more difficult to manage. There is less tooth structure under the new porcelain crowns to support the porcelain and give it strength. The tooth under the new porcelain crown is smaller, giving the crown less tooth to bond to and increasing the chances of losing a crown. That is most patients number one concern when considering a smile makeover. 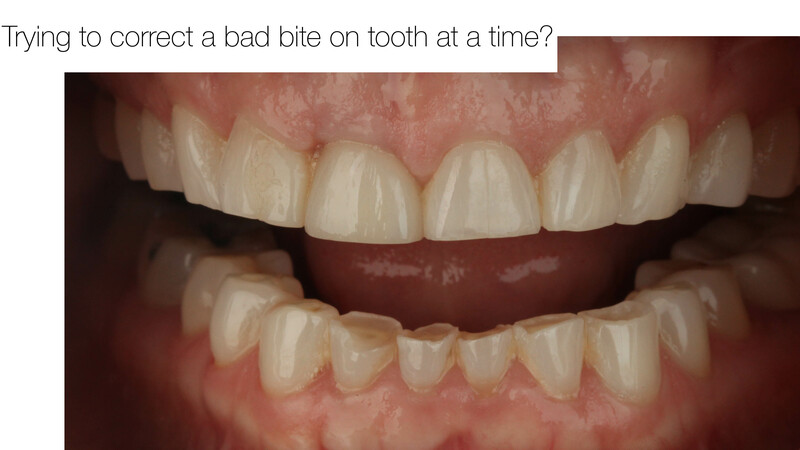 So, if you are reading this and wondering if you should be getting one crown at a time as your teeth slowly erode, it would be a good idea to get an opinion from a dentist who is highly qualified to do full mouth rehabilitations. You will be able to make better qualified decisions, if there is a plan for your mouth. The whole mouth can be corrected over just a few visits and for budget considerations, there are ways to phase treatments to have the whole mouth corrected over the course of a couple years. It gets to the point where you will end up with a crown on most of your teeth, because they break, get sensitive, ugly or too much dentin exposed. It can be done one tooth at a time with out a plan fixing the problems, but it is so much better to begin with the end in mind, correcting the cause of the problems and ending up with an amazing smile in the end. Here is an example of a full mouth rehabilitation. The patient had worn her teeth down and she wanted to have it corrected in the most conservative way possible. The lower third of her face was shortened from the tooth wear. After the full mouth rehabilitation using conservative all porcelain veneer technique, the lower third of her face looked longer and created a more youthful and feminine look to the face. The before and after close up of her top teeth show the advanced wear on her teeth. She had literally lost almost half a tooth from having a bad bite. Crowning these teeth to keep them from wearing down would have resulted in making them even smaller and still having small crowns. Planning a full mouth rehabilitation enabled us to add the tooth back that she had lost using porcelain veneers resulting in minimal or no preparation on her natural teeth and much more natural looking veneers. Classic signs of destroying teeth are worn lower front teeth and thin chipping enamel that looks translucent. If let go, this situation becomes worse as the teeth get smaller. Crowning teeth in this situation makes the problem worse. Adding to the tooth to make it normal length again enables us to utilize minimal preparation techniques to achieve long lasting results.